One of the most important tools needed to run a successful business is email. It's as important as a telephone number. However, it is all too common for businesses to have unreliable email service. Or they still rely on a free email service that gives an unprofessional impression to their customers. In my field of work, I have come across quite a few email providers. Some good, some okay, and some downright awful. How can you screw up email? Well, I have seen some pretty bad set ups. From mailboxes filling up so fast that the customer has to spend half their day downloading and deleting old emails. To people, not receiving emails because the client's email service IP address was blacklisted for spam. So what if you are not the most tech savvy? What email service should you look for? Well first off, if you are running a business you must have a name@yourbusienss.com address. That is a requirement! It shows people that you are serious and not running a hobby or running your business from your house (even if you might be). And if you have employees you need to make sure they can stay productive. If a company is having technical problems with their email service, that could not only cost the company productivity, it could cost the company customers! Okay, Jason, just get to the point! 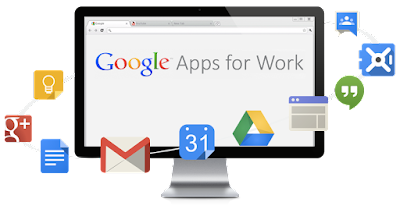 You need Google Apps for Work (now called G Suite). Of all of the email service providers, G Suite is hands down the best. Better than Godaddy, Microsoft 365, MS Exchanged, and all the other smaller services. Here are a few key reasons why I, as an IT professional, recommend G Suite. Email is 100% web based. No need to set up your email on a desktop program like Outlook or Thunderbird. All you'll need is a web browser and you can access your email anywhere. If you get a lot of junk mail, Gmail has advanced spam, malware, and phishing site filters to keep you safe from threats. Mobile set up is a snap. I can't tell you how many hours I have spent helping my clients set up their email on their phones and tablets. Simply tap "Add Account" 2. Select "Gmail" 3. Enter your emails address and password. 4. You're now ready to Rock & Roll. But wait, G Suite is so much more than just email. You also get a whole suite of cloud-based productivity apps to turbo charge your workload. All cloud-based, available anywhere, at no extra charge. Tricom is an Authorized Google G Suite for Work Partner and Certified Administrator. For more information call (866) 447-4174.